Overall, our experience with Hisnibbs was amazing! We booked him for my friends bachelorette party. He drove up to Collingwood to prepare a wonderful 5 course meal for 16 women. The food, presentation, and experience exceeded all expectations! I would definitely book Rick again!! Chef Rick was amazing to work with for our small wedding! He was prompt and clear with communication, and virtually every dish he suggested sounded delicious. On the day of the event, he made it so easy and the food was SPECTACULAR. Piping hot, well-flavoured, and presented beautifully. The roast beef was perfect and anyone who had the chicken wanted 2nds and 3rds. Hands down the best wedding buffet I've ever had. Don't hesitate to book Hisnibbs for your next event - you won't be disappointed. Daughter's Baby Shower Milton June 2016 I would spend days preparing food for events like this but I opted to get this event catered by His Nibbs. Rick was awesome to work with. He was very detailed and creative. He personalized our event with suggestions such as pink chocolate covered strawberries and mini beef Wellingtons formed in flower shaped pastry that made our party more elegant and played well with the Pink Girly shower theme. Everyone raved about the delicious food! Rick was a pleasure to work with because of his quick responses, creative suggestions and follow up. The food is great, the service top-notch and the delivery flawless. Bravo and well done. We will definitely recommend His Nibbs. I have had very positive feedback too and felt I should share with you. The caterer was just too good! Mom, you could not have hired a better person than Rick. He did an impressive selection of food. The food was very very delicious. It was served well spaced out and in a timely manner. The server was very polite and she too did an amazing job by making sure people needs are met by seeking out the vegetarians and make sure they are fed as well. Overall the whole bridal shower catered food was great. Everyone said they had more than enough food to eat. Thanks to Rick and his team! "Caterer was excellent. I think everyone loved how the lady walked around and cleaned up after people that was a nice touch and the scallops were just phenomenal". "The caterer did an excellent job. All food was prepared very well. The items I ate taste great! Service was also good"
His Nibbs catering just delivered a fabulous luncheon for my mother's 90th birthday party! We were so impressed with Rick and the quality of the food he produced - it was truly amazing! Not only that, but he was on time, professional, polite and super easy to work with during the planning stages. I would highly recommend Rick and His Nibbs Catering for any occasion you might be thinking of. Thank you again Rick - it was a genuine delight working with you - and all 60 attendees at the luncheon agreed - the food was absolutely wonderful! On July 10, 2016 I had a 90th Birthday Party for my husband. Rick catered to 47 guests and each & everyone of them couldn't say enough about Rick and his outstanding performance. The appetizers and the main course we're served in a very professional manner. Any questions that I need answered during the planning was answered quickly by Rick and my mind was at ease during the entire planning. 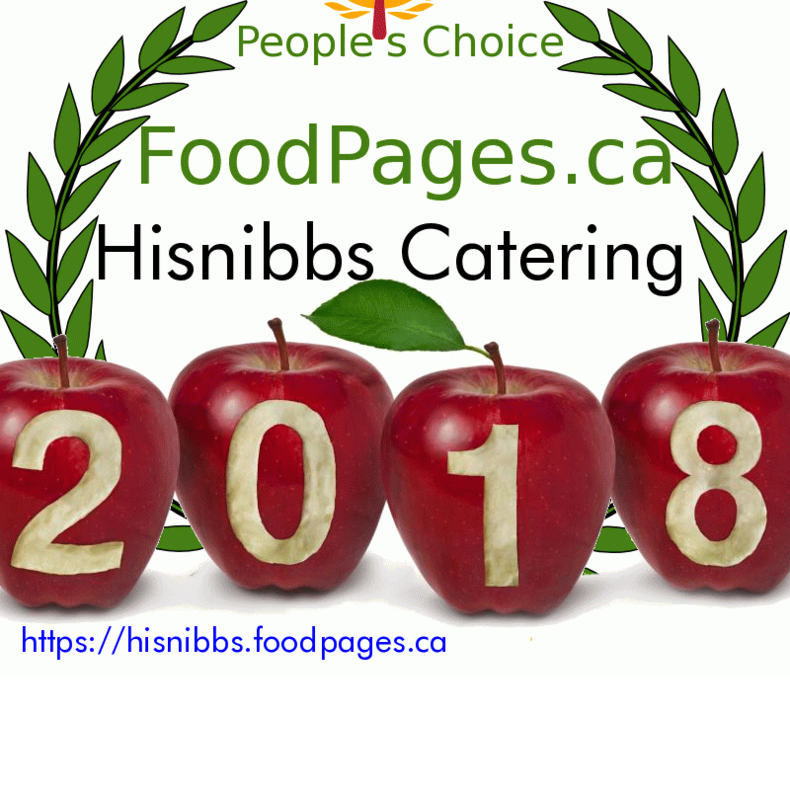 I would highly recommend Hisnibbs catering to anyone who require fast & efficient service from the beginning to the end. Great 5 course sitdown for my friends! The girls complimented all night about the creative food,the tasty Prime rib, and the white chocolate crème brule was to die for!! We will definitely be using Hisnibbs services again in the future! Hey Rick, many thanks to the wonderful catering service, people raved about the food, especially the homemade falafels and wonderful service! Amanda was lovely, courteous and helpful! Hisnibbs has been a great asset to our dinner parties, and would definitely recommend your services. Thanks again for making the celebration so successful! "Wedding at Fountain Blu (CNE) for 250 people"
Hi Rick, First off, the food was amazing!!! Thank you thank you so much!! !Couldn't hear anything but compliments. The poutine and smores station turned out awesome and the gravy was wicked!! Everyone, including the grandmas were happy about the whole night. "Baby Shower - Milton Ontario"
We had the pleasant experience of having His Nibbs at our home to cater a baby shower.Everyone complimented Rick on the delicious food! Rick was a pleasure to work with because of his quick responses, creative suggestions and follow up. He made the planning easy. Highly recommend Rick and many of our guests took his business cards! "Highly Recomended!! - Milton Office Luncheon"
We had Hisnibbs cater our company anniversary lunch. All of it was AMAZING!!! Chicken Supreme, Maple Glazed Salmon, Crab Stuffed Mushrooms and Creme Brule were all fantastic! Our lunch arrived right on time and perfect! Rick was very professional and knew exactly what to suggest for us :) Thank you. We will be ordering again!! His Nibbs did an amazing job of catering my best friend's tenth wedding anniversary/recommittment ceremony. Rick executed every single dish, down to the condiments, accents and vessels used for the dishes, with precision, flavour and mouthwatering goodness. Our guests were satiated, satisfied and excited with the diverse collection of savoury morsels (served in abundance) and delectable desserts. From the fresh beef sliders, satay, scallops, bacon and lamb to the creme brûlée, tiramisu, profiteroles and strawberry shortcake wedding cake (one of my many favourites), Rick is an amazingly talented chef, personable and always willing to help and please. His server Alicia was charismatic and was sure to keep guests bellies full. The amazing meals are followed by stunning customer service. One of our guests (the bride's childhood friend's father) was so impressed he made a point of emphasizing that in forty years of working in the restaurant industry that His Nibbs food was the best he had ever experienced! Thank you so very much, Rick for being part of such a magical day for my best friend and ensuring everything was perfect from start to finish. We look forward to you catering all of our events from here on out.